It has been such a long time since I picked up a watercolour brush. It feels like at least a year! Could it really be that long? This almost never happens and having worked on the bear for as long as I could without the risk of either smudging or overdosing on fumes, it was time to put him to one side. The problem was, I just didn’t want to leave the art room! After all, nobody was going to be home until at least 8 o'clock. It would be criminal not to make the most of that time to myself, wouldn't it? I have always both admired and envied those people that complete a small painting from start to finish in just one day and as I pondered on the fact that it was 3.30pm already, I couldn’t help but wonder if I could actually do that myself. I knew that if I attempted it, I would have to pull out those dusty watercolours but, hmmm… did I really want to go back there? After all, my experience with watercolours under the guidance of a tutor was not good - at all! Then I remembered a still life I had set up a long time ago. I still had the photograph I had taken of the arrangement, so I thought, why not have a go? Well it seems that sometimes it really does pay to walk away and come back at a later date. The break I took from watercolours has enabled me to shed all of the influences that had been drummed in to me back then by a tutor. I was so irritated by that constant pressure to paint 'loosely' - Ugh, I began to hate that word! It was so refreshing to walk in to my studio and just a short while later walk out with a finished painting! My Vintage Bears take such a long time because I have to allow for so much drying time between layers. But now I have something else I can do while my oil layers are drying. And I am surprised to say that I am actually excited about using watercolour again. I just can not wait to do another one! Soooo beautiful, Sandra! And it is so right the approach you have taken, free from the impositions of others, free to be as you wish with the watercolors! and you can see, it has worked ... it is like a renewed love between you and watercolors! A big hug! Ciao! It is beautiful Sandra! I am so glad you did this, and your positive attitude is evidence that painting the way that feels right to you is the ONLY way to go!! Bravo Sandra, you did wonderful work, can't wait to see more. :) And So glad you had the day to yourself, that sounds heavenly!! It is so wonderful that you discovered watercolour again, Sandra, and finding your own way, indeed the only way to go! It's beautiful! Well I'm totally impressed, it works really well, Sandra. You must be really over the moon with your new freedom. I don't have the same problems as you: no coats waiting to dry etc. My 'problem' is the length of time I take to finish a picture. People used to be constantly telling me that I didn't conform in my techniques. I learnt to ignore them. Nice to see you so happy, and producing wonderful pictures! Marvelous painting Sandra. I like the word cool through the martini glass. Wonderful little cherry too! Cette aquarelle est vraiment très belle. Toutes mes félicitations. Sandra, always paint the way you feel... and this looks like you felt pretty good!!! Oh Sandra..this is truly beautiful! Watercolor is so so difficult and you make it look so easy...I hope to see more of these paintings...the glass looks so transparent ..perfectly painted. a aquarela ficou primorosa e autêntica! Fico feliz de saber que você se livrou da influência do professor para pintar como você sente, como é natural e espontâneo. Isso é arte! his watercolors was excellent and authentic! It's good to get rid of the influence of teachers, is the only way to make art! i love this! as you know, i also love water and glass reflections just a tad and this is beautiful! i still haven't really discovered how to use watercolour "properly" whatever that is and like you, i admire folk that can make it look all wishy washy and wonderful but your style is photo realistic and your tutor should surely have encouraged that amazing talent instead of trying to get you to paint in a style you weren't comfortable with. this is just perfect! So glad you discovered your own watercolour voice again. I've missed seeing it. "Art is not about self actualization. It is about self realization". So it is not about being able to do what somebody else is able to do. But it is about doing that which makes you at peace. So WELL DONE. Oh my, this is just wonderful! Love how you managed to get the glass and the liquid so perfect and real! So funny, I have spent the whole weekend painting with watercolours too, taking them out again after quite a while. I also like that loose, flowy, typical watercolour style, but I can't do it. But I think (although I'm sure that there are many traditional watercolourists who disagree) that it's perfectly okay to ignore the typical traditions and conventions and use them whatever way you want (and that includes using black and white!). You did a terrific job here. 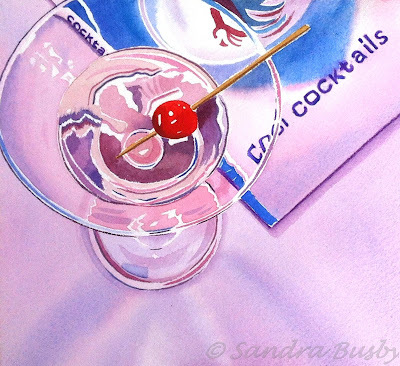 A very lovely painting indeed, Sandra! I think it's very healthy and helpful to 'change lanes' from time to time in our exploration of art. Last summer, I did exactly the reverse to what you have just done - I had a brief flirtation with oils but returned to my watercolours later in the year with renewed passion ! Hi Michael. Yes, I remember that! Greetings from Barcelona Sandra. Nice works. Nice header blog. If you like visit my blog. so good to see you painting and enjoying watercolours again sandra !!! absolutely lovely sandra! hope you are well my friend. Hi Suzanne. Thank you so much for popping by for a catch up. It means a lot. Seu trabalho é maravilhoso, fiquei encantada com sua pintura. Parabéns pela arte. Vou seguir seu blog pra voltar novamente. Muito obrigado pela visita! Estou tão feliz que você gosta do que você encontrou. Obrigada querida pela presença. Fiquei muito feliz com sua opinião e seu comentário. Adorei sua aquarela. Beijos e obrigada!! Hi Sandra, finally, after my exhibition, I have found the time (not a lot indeed) to visit some of my blogs friends and I was dazzled by the beauty of this watercolor! A very lovely painting indeed. It is so nice that I think you should dedicate most time to watercolors!! Hugs! I love pink and purple watercolour, and this one is perfect! Maybee you should try to sell this one as drink-menues?